Soaring inflation can arrive like a thief in the night. One need look no further than socialist Venezuela, where a single cup of coffee can now cost three weeks’ wages. That same type of hyperinflation hit Germany’s socialist Weimar Republic following World War I and the cost of goods was rising literally by the minute. This same hyperinflation could happen in America because of the rapid socialist drift but with the right preparation you can survive and even thrive when it happens. This White Paper is a do-it-yourself guide for sheltering yourself and your family from the coming risk. 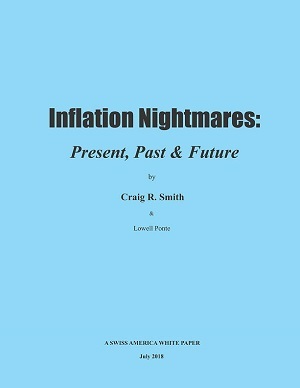 Call 800-289-2646 now for a Free copy of Inflation Nightmares: Present, Past & Future or register below.